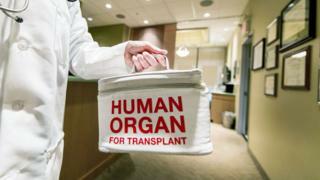 More than 50,000 people in the UK are alive today because of organ transplantation, new data suggests. NHS Blood and Transplant said that figure included 36,300 kidney patients, 9,800 given livers, 1,900 who received a pancreas, and 1,000 who were given an intestine transplant. It marks the first time the 50,000 barrier has been broken, the NHS added. The number of registered organ donors also reached a record of 23.6 million - up 4.9 million over five years. Yearly transplant figures have risen by 20% over the last five years to a record 4,753 in 2016/17, with some of those patients receiving more than one organ. Some 36% of people in the UK are now on the NHS Organ Donor Register, compared with 30% five years ago. Currently in England and Northern Ireland, people must join the register or their family or close friends must give consent before their organs can be used. People in Scotland are set to automatically become organ donors unless they opt out - following a similar move introduced in Wales in 2015. But the move has for now been rejected in England and Northern Ireland, which instead relies on public awareness campaigns. Sally Johnson, director of organ donation and transplantation for NHS Blood and Transplant, said: "Our specialist nurses in organ donation are now almost always involved in discussions with families over organ donation. "Families tell us donation is a source of pride that helps them in their grieving process." However, the report showed there is still a shortage of organ donors. There were 457 people who died last year while on the active transplant waiting list, which means they were ready to receive a donor organ but did not get one in time. A further 875 people were removed from the list - in most cases because they became too ill to undergo transplant surgery. Around 3,000 more people need a donor but are currently suspended from the list. Reasons for this can include being temporarily too ill to undergo a transplant or because they are abroad. Steve Gazzard's daughter Sarah suffered from a rare lung condition - idiopathic pulmonary fibrosis - and died aged 36 while waiting for a double lung transplant. She was put on the top of the waiting list in 2012 but died in November of that year - three sets of lungs became available in the week after her death. Steve told BBC Radio 5 Live: "Unfortunately Sarah didn't get her transplant but she donated her organs (two kidneys and her liver) and there are now three people alive who only had weeks to live. "It is a total lottery and that's why I made a promise to Sarah that I would continue the fight to get the law changed to an opt-out system. "Another promise I made to Sarah is I would continue with this campaign to sign people up." He holds an event every week in Exmouth, signing up over 4,700 new donors since 2012, and Steve says the town now has the highest sign-up rate for any town of the same size in the country. The study also showed that survival rates continue to improve once people get a transplant. In the early 1990s, an adult undergoing a common kidney transplant had a 66% chance the organ would still be functioning after five years. Now this figure stands at 87%. Health minister Jackie Doyle-Price said: "These numbers show excellent progress and are a testament to the brilliant work of NHS Blood and Transplant and all those involved. "Now we need more organ donors to come forward so everyone requiring a transplant stands the best chance of receiving one."